Smoker Temperature, Smoking Time and More! There are more turkey smoking tips here than you can shake a stick at! Well, not really, but you will find a few smoked turkey tips and techniques that could be useful in your quest for the perfect Thanksgiving table centerpiece. Ideal smoker temperature for turkeys, smoking time required, the internal temperature of a safely done turkey, resting a turkey fresh out of the smoker, freezing leftover smoked turkey and heating it back up. Those are the topics you'll read about as you continue down the page. 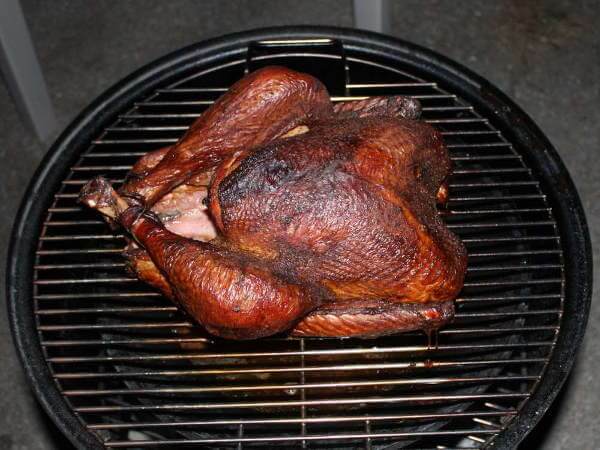 What's The Best Smoker Temperature for Making The Perfect Smoked Turkey? Turkey can be smoked at a smoker temperature as low as 225 degrees, but it's much quicker if smoked at 275-300 degrees, or even higher. When smoking at a lower temperature you're looking at more time in the smoker, but that means the turkey could potentially have a richer smoke flavor. Smoked at a higher temperature the skin will become more browned, and might even get a little crispy. And it'll take less time. I prefer to smoke whole turkeys at the 250 to 275 degree range. 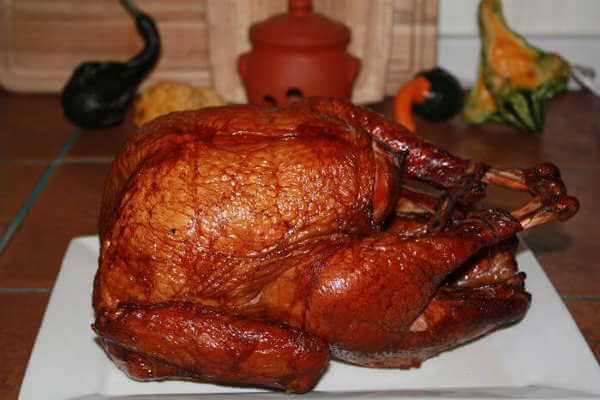 The skin gets good color, the turkey gets a good dose of smoke flavor and doesn't take forever to finish cooking. If you've never smoked a turkey in your smoker before, making plans around the turkey being done at a certain time is a recipe for disaster. 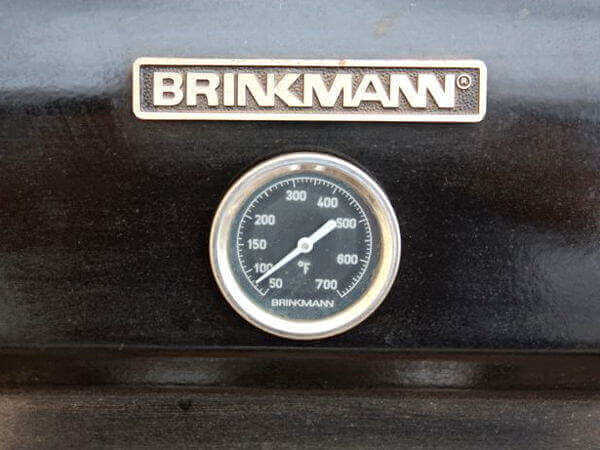 The temperature gauge on your smoker might be off, reading higher or lower than the actual temperature. 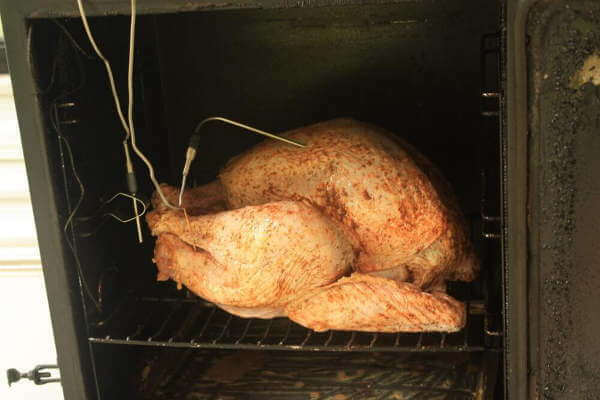 Use a remote thermometer and position the probe next to the turkey to know the true smoker temperature. Better yet, get a quality smoker thermometer with dual probes. One probe measures meat temperature, the other monitors the smoker temperature. Opening the smoker to add wood chips or charcoal, check the turkey temperature, baste the turkey, or "just looking" to see how the turkey's doing can add 15 minutes or more to the cooking time, each time you open the smoker. The wind may pick up, wreaking havoc on your attempts to maintain a steady smoker temperature. The bigger the turkey, the longer it's gonna take! It's smart to test-smoke a turkey or two in the weeks before Thanksgiving, when there are no time constraints. After a couple of practice runs, you'll have a much better idea of how long it takes to smoke a turkey in your smoker when the big day comes. However, these times are just an estimate. The true test of turkey doneness is the trusty smoker thermometer. How Do You Know When Your Smoked Turkey Is Done? The best way to know when a turkey is done is to use an accurate meat thermometer. According to the USDA, all parts of the turkey have to reach at minimum 165 degrees before considered safe to eat. 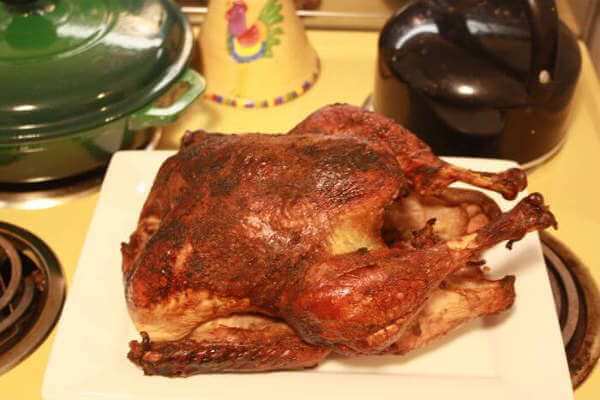 If the turkey was smoked at around the 300 degree range, remove it from the smoke when the breast reaches 160 degrees. After the turkey is removed from the smoker the internal temperature will continue to rise another 5 degrees or so, bringing the turkey up to a safe temperature. If it was smoked at 225 degrees, let the turkey temp make it all the way up to 165 before removing it from the smoker. Cooked at a lower temperature there won't be much of a temperature rise when it's taken from the smoker. The breast meat is great at when it hits 165, but I prefer the dark meat cooked to a higher temperature. And that's usually the case, since the drumsticks and thighs are closer to the rising heat of the smoker. 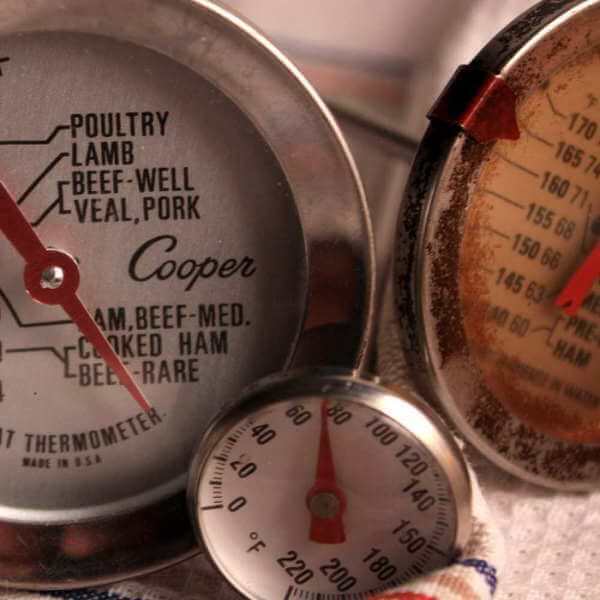 The ideal thermometer to use is a remote, dual probe smoker thermometer. One probe is left in the meat throughout smoking and the other is clipped to the grate, measuring the smoke chamber temperature. With the remote unit you can monitor the temperature of both the smoker and the turkey at a distance of up to 300 feet. You won't have to open the smoker up to check the temperature either, which shortens cooking time. It's a good idea to let the turkey rest after smoking, for 15 minutes to 1/2 hour. If you position the turkey breast side down as it rests, it's possible that the breast meat will be a little more juicy. Gravity, you know? 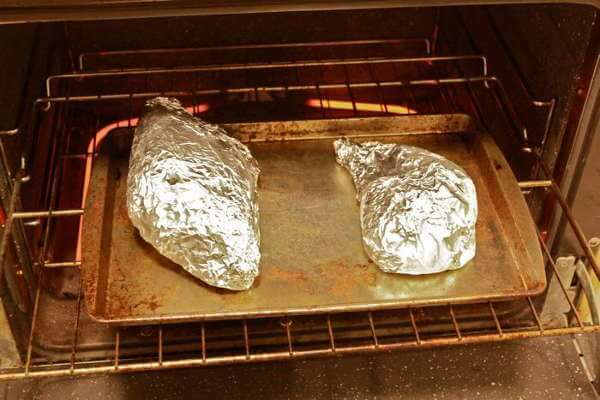 Place the smoked turkey in a clean pan or on a platter and cover it loosely with aluminum foil. If you need to hold the turkey for a while before it's time to serve, you can place it in a dry cooler, covering it with a few clean bath towels or a blanket before closing the cooler lid. You have a couple of options here. Remove all the meat from the carcass and freeze it in food storage containers, or freeze it with the bones intact, either as a whole turkey or divided into sections. I usually separate the leg quarters, wings and breast from the backbone and ribs, and wrap those tightly in a couple layers of heavy duty foil. I'll pick the meat from what remains and pack it in a freezer container. Or I'll just sit down with a beer and munch on the back meat for a while. To reheat frozen turkey, it can be placed directly in a 300 degree oven and heated for approximately 20 minutes per pound, or until the turkey reaches 145-150 degrees. Don't overheat it since it's already fully cooked. It just needs some gentle warming. Now that you've read more turkey smoking tips than you ever thought you would, why don't you get out there and smoke yourself a turkey!